A graduate in Mathematics and postgraduate in films, Bhupendra has been among the finest political journalists of his generation. He has that unique ability to grasp things at a micro level and then present them with a macro level understanding. He is amongst those journalists who depend more on their ground political awareness supplementing it with academic awareness of issues that confront the nation. 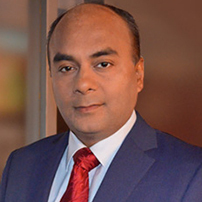 Bhupendra was the Executive Editor of CNN IBN and used to host the prime time broadcast “India at 9” before turning a Consulting Editor to try his hand at new journalistic platforms. He now hosts a weekend interview show “Hot Seat” where he puts tough questions to key newsmakers. He regularly writes with columns for various English and Hindi newspapers and magazines. He also writes for several digital platforms. He lives in the national capital with his wife and two children.